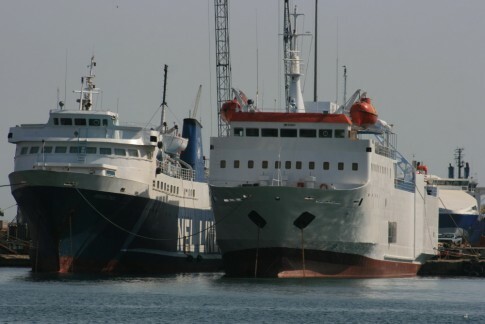 Rigel (ex-Bore I, Ilich, Baltic Kristina), Sveti Stefan II (ex-Prinz Hamlet, Nieborow) and Adriatica I (ex-Silesia) at Bari. Click for larger image. The paddle steamer Lincoln Castle is up for sale for Â£20,000. 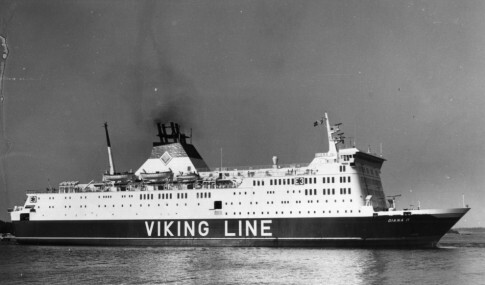 The last of the trio of ships built for the New Holland-Hull ferry service of the LNER, this ship, along with her two earlier routemates, the Tattershall and Wingfield Castles, eventually passed to Sealink in whose unlikely hands the service closed in 1981 upon completion of the Humber Bridge. The Lincoln Castle had been withdrawn in 1978 however and has served as a bar and restaurant ever since, for the past twenty years in Grimsby. 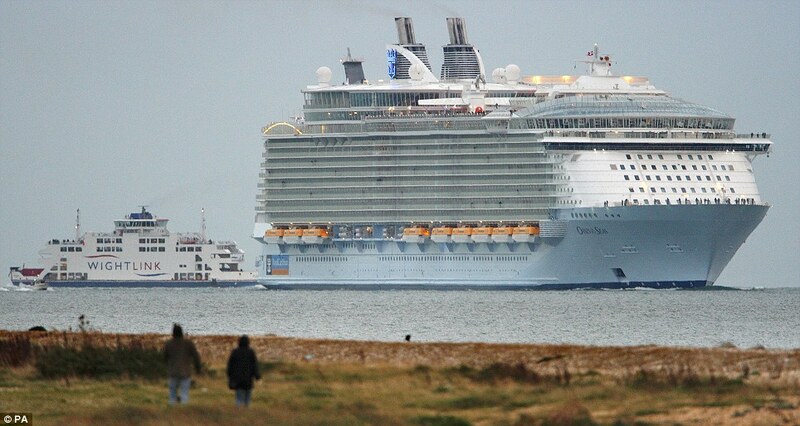 The call of the Oasis of the Seas at Southampton in early November, en route to Fort Lauderdale on her delivery voyage, brought the chance to compare sizes with the local Isle of Wight ferry fleet, such as the St Clare, seen here in the Daily Mail. An even more astounding comparison however was this picture of the ship with Brittany Ferries’ Mont St Michel – one of the largest cross-channel car ferries, but completely dwarfed by the ‘OOTS’. Several months ago we looked at B&I Line’s first purpose-built car ferry, the Munster of 1968. irishships.com has an interesting series of photographs from on board, both general views and crew scenes. The Maersk ‘D’ class have a series of artworks on board by different modernist Danish artists – Jan van Lokhorst on the Maersk Dunkerque, Anne VilsbÃ¸ll (Maersk Delft) and Per Arnoldi (most recently famous in the UK for his work on Michael Winner’s National Police Memorial in London) on the Maersk Dover. Van Lokhurst’s website has a series of images of his work on the first ship including pictures of the creative and manufacturing process whilst VilsbÃ¸ll can be seen here working on some of her paintings for the ‘Delft’. 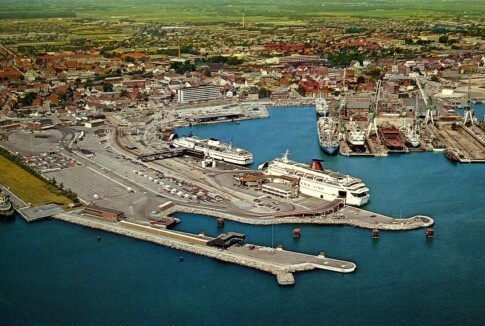 Over on LandgÃ¥ngen they have been discussing in minute detail the changes to the berthing arrangements at Frederikshaven between the Stena and Sessan terminals. Meanwhile on the Nautilia messageboard there are 143 pages discussing the Agios Georgios (ex-Hengist) and 57 pages on ‘Historic Photos of Piraeus port’. In many ways it is a shame that there is no equivalent all-encompassing British forum for the analysis of not only the endlessly trivial minutiae but also the broader fascinating history of the British short-sea passenger shipping scene. 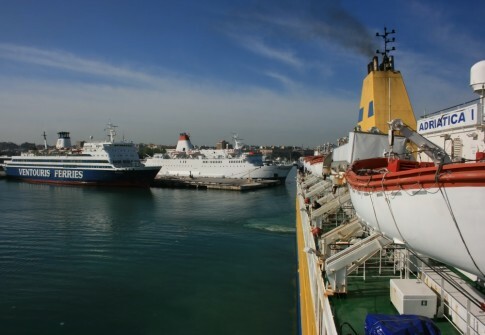 It would perhaps be impossible to rival nautilia’s seemingly comprehensive catalogue of Greek ferries, where every ship, historic or modern, has its own thread, but it would be nice to try. The Prince of Wales was the last-built of the SRN-4 hovercraft, being delivered as late as 1977, five years after the previous example, the Sir Christopher. Withdrawn after just 14 years service, she was destroyed in 1993, whilst laid up in reserve, by an electrical fire. Together with other period images, here are some photographs of the craft being broken up after this event on the hoverpad at Dover. The SeaCat berth at the Hoverport was under construction at the same time. Not quite as successful as the SRN-4s were the French SEDAM Naviplanes. The tortuous delivery voyage of the IngÃ©nieur Jean Bertin, the only example of the type to actually enter service, is chronicled here. The much heralded conversion of former overnight ferries into ‘Accommodation/Repair Vessels’ (ARVs) has hit trouble. Work on the ARV 2 (formerly the Normandy, St Nicholas, Prinsessan Birgitta) has been halted before even starting. Shippax reports that the ARV1, which was delayed during rebuilding, was the other contender for the 18 month accommodation contract near Perth won by Hurtigruten’s Finnmarken. The former Meloodia/Diana II therefore remains laid up in Singapore. Some coverage of the ship during her extensive refurbishment can be seen here and more details of what has been done can be gleaned from the ship’s new General Arrangement plan. Now travelling between Bari and Albania, the ice breaking capacity of the Rigel sees little use. That was not the case during her previous life as the Baltic Kristina of Riga Sea Lines, as this photostory demonstrates. Having mentioned the early Trasmed. car ferries last month, it would be remiss not to point readers in the direction of trasmeships.es which has a host of interesting photographs from various ship through the history of the Spanish company. With the volume of ships covered it is a little hard to pick out favourites, but the Ciudad de Tarifa, Las Palmas de Gran Canaria, Ciudad de Valencia (now Mary the Queen), and the Ciudad de Sevilla are particularly interesting, the latter page including startling images of the ship’s determined attempt to sink herself off Palma in October 1982. The Ciudad de Valencia at Ibiza in August 2003. The abandoned wreck of the poor old Assalama (formerly Trasmed’s Ciudad de la Laguna and originally the Bore Line (Silja) Botnia of 1967) remains at Tarfaya, over one and a half years since she sank just after leaving port. Some interesting footage from that day in April 2008 can be seen here and here. 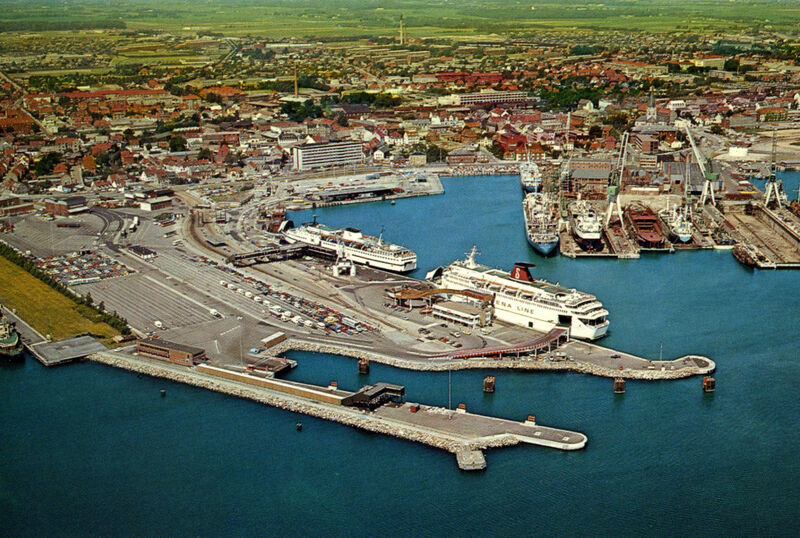 The very first ship of freight operator Truckline Ferries was the Poole Antelope which, 11 years before the company was purchased by Brittany Ferries, entered service in 1973 between Poole and Cherbourg, followed shortly after by her sister the Dauphin de Cherbourg. This pair are slightly glossed over in histories of Truckline, being too small, too slow and sold within a couple of years. Whilst the second ship has rather passed into obscurity (she became an oilfield research vessel in China named Bin Hai 504 (sometimes seen as Rin Hai 504)), the Poole Antelope was ultimately converted into a passenger ship and at present is offering regular ferry services for Ukrferry between Odessa in the Ukraine and Istanbul in Turkey under the name Caledonia. 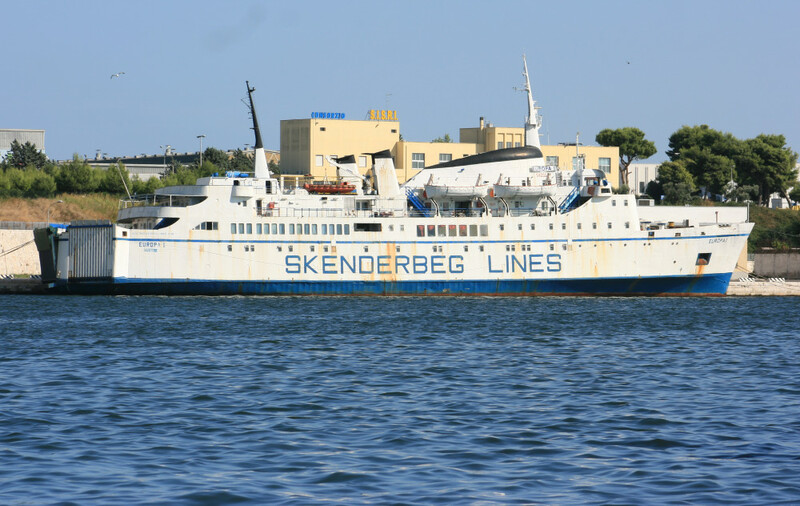 Ukrferry also offer cruises on the ship and the website for this side of the operation has plenty of photographs together with a deckplan. Ukrferry also operate the former Scandlines vessel Greifswald and, since her return from charter to ISCOMAR for Ibiza sailings as the BegoÃ±a del Mar, the Yuzhnaya Palmyra (ex-Silesia). The latter has her own website here and maintains the Odessa-Istanbul service in Summer. The Express Santorini (ex-Chartres) is back in Greece, presently operating for ANEK on a subsidy-munching Piraeus-Patmos-Leipsoi-Leros-Kalymnos-Kos-Symi-Rhodes routing. This after another Summer on Charter to Atlanticoline in the Azores. According to this report, she continued to make a favourable impression and is in excellent condition “due to good maintenance, since it is owned by Hellenic Seaways”. That last point is, to be fair, not as unlikely as it sounds; HSW are not GA Ferries. Nonetheless, it seems the ship did have a little trouble with that side ramp installed for use on the charter. Back home, and with the demise of GA Ferries and SAOS, there must be some demand for smaller, cheap-to-run ships for use on the subsidised routes beyond just refit cover so the ‘Santorini’ may yet have a future in Greece. If so, it would be nice to see that side door removed altogether. The Porfyrousa (ex-Canbulat Pasa) at Drapetsona in July 2008. On the left of the photograph is NEL's Panagia Tinou and in the background the same company's former Aeolos Kenteris, by then the Red Sea I. In September’s Things Seen I mentioned the fleet of FergÃ¼n Shipping of Turkey. The company’s website is not the most up to date, but I, sort of, implied that the Canbulat Pasa as the newest member of the conventional fleet was probably still in service. Richard Seville rushes to correct, reminding me that we in fact encountered the ship whilst visiting the Aegean Heaven mid-refit at Drapetsona in July 2008. 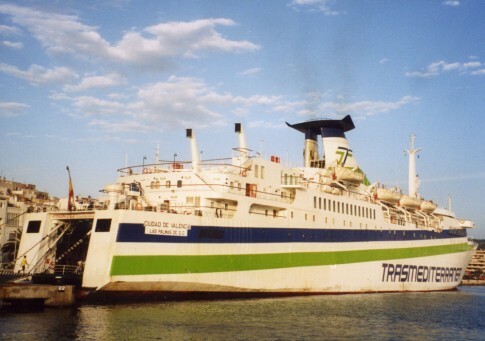 She was in the process of being renamed Porfyrousa and has since taken up service on the local routes out of Kythera. There are some interesting thoughts, upon which it would be wisest not to comment, on the happenings which preceded the introduction of the ship in Greece here. Mention of Drapetsona prompts me to draw attention to the redevelopment plan for the area. You’d have to think this has a fair chance of never happening, but what a revolution it would be. I can see the Beach Club, the Family Entertainment Zone and the Retail Zone/Marina. But where is the long quayside where ferries of all kinds go to lay up – many forever? Is that what Sunset Park is maybe? What would Drapetsona be without the laid-up Alkyon? The wreck of the Express Samina is the rather haunting location for this video on youtube. The act of boarding the modern ferry has perhaps through familiarity lost some of the excitement of days gone by but this video from 1995 of Minoan Lines’ Fedra at Venice shows that even lorry drivers can make something interesting from an otherwise mundane day to day experience. Ghosts from the past can live forever on the internet, and that is the case with Hellenic Mediterranean Lines whose website is still offering sailings from Brindisi to Corfu, Igoumenitsa, Paxi, Zakynthos, Cefallonia and Patras on the Egnatia III and the Poseidonia, just as if it was still 2003. Another operator living in the past is Skenderbeg Lines, where it is forever 2004. Their Europa I remains laid up in Brindisi, as she has been since 2007. Her heroic past was remembered on 30 October however, 18 years to the day since the ship, then Jadrolinija’s Slavija I, led the ‘Libertas Convoy’ to Dubrovnik in an attempt to help stop the destruction of the latter city during the Croatian War of Independence. With numerous tourist and fishing boats following and with on board, amongst others, Stipe MesiÄ‡, today the President of Croatia, the ship sailed down the coast to besieged Dubrovnik. The ship was intended for 600 passengers, but there was a crowd of 3,500 people on board. We approached the ship coming through the GruÅ¾ harbour which was littered with sunken, capsized or burnt down ships. Smoke was rising out of the burning installations for days. We were being watched by those on the top of the hill, not being able to do anything but think they would start to shoot at any moment. On board that ship, I was contemplating about the ships crowded with Jews on their way out of Germany in the late thirties, as well as the abandonment of Saigon. We were at the very bottom of the shipâ€™s garage. It was simply not possible for the cars and trucks to embark because the ship was crammed with men, children, women, elderly and sick people. The sick were lying on the metal floor, with their I.V. drips hanging up in the air. Tears and silence were hand in hand. Faces were totally changed with crying, haggard because of the silence. People were lying on the stairs in positions I had never seen before, fifteen persons per cabin. One could step between human bodies only too carefully. As we sailed out, huge waves were tossing the ship up and down, so many people vomitted, were nauseous, felt psychical discomfort. Doctors were sought on all sides, painful crying expressed a thousand year old Croatian suffering, agony of yet unborn children to 90 year old people. 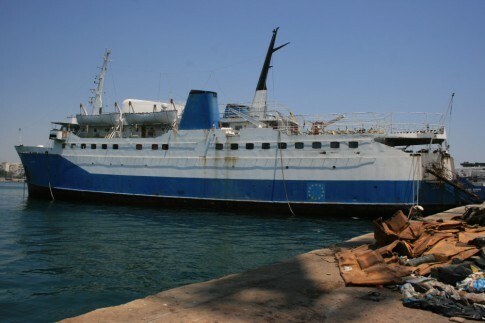 The Europa I (ex-Slavija I) laid up in Brindisi, August 2009. Following on from the British PathÃ© website mentioned in October, this month it is time to investigate a French equivalent, ina.fr. Having just mentioned the Arromanches, it does not seem inappropriate to begin with coverage of her launching in March 1946. And, lastly, some epic coverage of the maiden voyage of the France. The Skagen of 1958, built for KDS’ Kristiansand-Hirtshals route, was a fine early example of what now seem quite small passenger and vehicle ferries designed by Knud E Hansen. The ship passed later to Fred. Olsen before she was sold in the 1970s for use as a ‘mother ship’ for mini submersibles used in oil exploration. 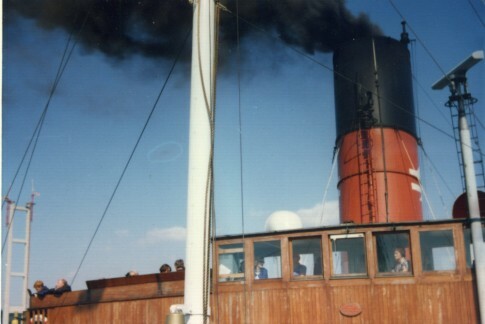 Latterly renamed the Pan Trader, she survives in Norway to this day, and these pictures on Flickr demonstrate that much of her original interior is still intact (compare with these ‘as built’ images on Fakta om Fartyg).